I'm starting with the easy option, choosing a full nail image. To get a good idea of what will end up on the nail, you can take a piece of paper and cut out a shape. Option 1: put your finger on the paper and draw a line at the tip of your nail and make it about as wide as your nail. Then draw a line next to your finger where your nail begins, so you have an idea of the height. Connect the lines and roughly cut out a nail shape, matching the width and length of your nail(s). I went with just 1 nailsize here, my middlefinger size, but you can of course cut out a seperate nail matching each finger. Move the paper over the plate and pick your image. Option 2: stamp an image with a size that's perfect for your nails on the paper, and cut that shape out. If you prefer a more sturdy option, I'd suggest to use thicker paper and a hobby knife to cut the preferred sizes. 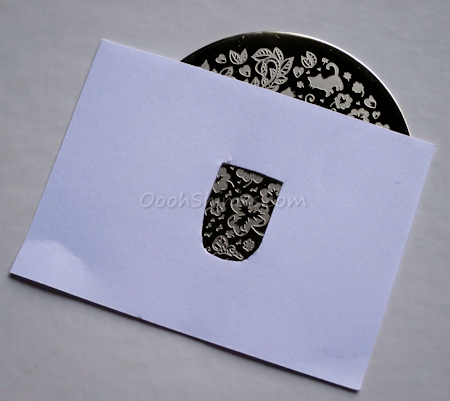 A card like this can simply be stored with your stamping stuff and used whenever you like. After choosing an image you can of course continue your usual way of stamping, polish, scrape and stamp, but you'll end up having to do a lot of cleanup with these kind of plates! 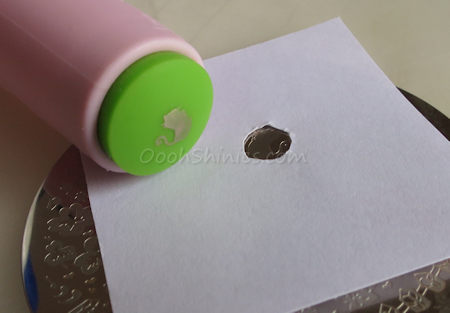 So another option is to polish & scrape, put your paper over the spot you chose and then press your stamper on it. 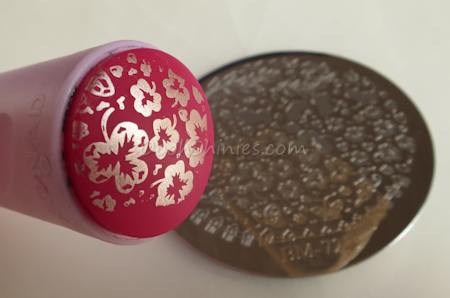 You'll get a much cleaner result, and the image will look more like a standard full nail image on your stamper. This can be extra handy when you're using a polish that's very pigmented, to prevent stained fingers! However, if you have the thicker card, this won't work as well, because it'll be harder to pick up the image. - Taping around the image, then polish and scrape (with the intention to quickly remove the tape before picking up the image with the stamper). Even thin tape will be too high to scrape properly. - Cleaning around the image on the plate after scraping. By the time you're done, the image will be dry. What did work, is the paper method shown above, but then in a smaller version. Cut a small shape out of the paper, polish, scrape, apply the paper and pick the image up with your stamp. But as you can imagine, this won't always work. A finer lined image and a quick drying polish will be dry when you're done positioning the paper, and some images are so woven into others that it'll be impossible to cut it out of paper properly. The next option that does work, is making a decal of the image. The reason for making a decal is simple, by the time you're done cleaning around the image, it'll be dry. 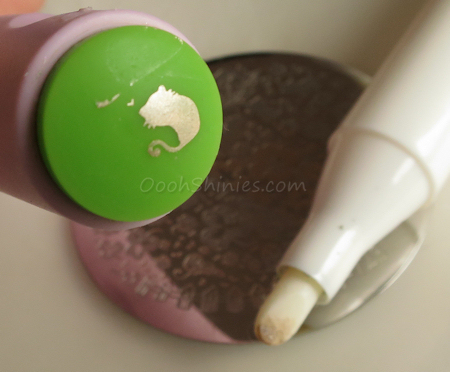 For the first option (the cleanup option) you polish/scrape/stamp as usual, but then you use a cleanup tool (a cotton swab, a nail art brush, or a polish remover pen) with remover and carefully clean around the image on your stamper. After this you can continue making a decal out of it, as shown further down. I prefer using a polish remover pen for this option, it doesn't need a lot of remover to clean so there's less chance of excess remover touching your image, it's harder so you won't have to put a lot of pressure to wipe the excess away, and it's not as fluffy or blunt as a cotton swab. Another decal option, is the tape option. 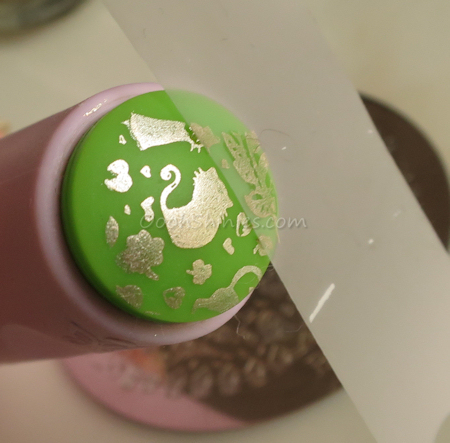 Tape is perfect for cleaning a stamper and gives great & quick result. Using a lint roller is handy for normal stamper cleanup, but it's obviously a bit too big for this and cutting pieces of it isn't as handy, so I prefer smaller strips of tape. The last step is making a decal of your cleaned image. Apply a thin layer of top coat over your image on the stamper (as always with nail art, apply the top coat floating to prevent smudges), and let it dry fully. 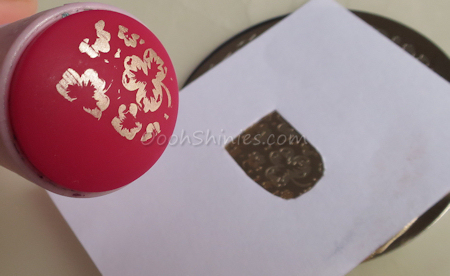 After that you can take it off the stamper and apply the decal to your nail, then seal it in with top coat. I think it works best to apply it on an almost dry base, if the base is too wet, you'll get smudgy polish underneath. If it's too dry, it obviously won't stick. - If you use too much top coat around the decal, you can cut it smaller, but be careful, the decals are often fragile and can tear easily. 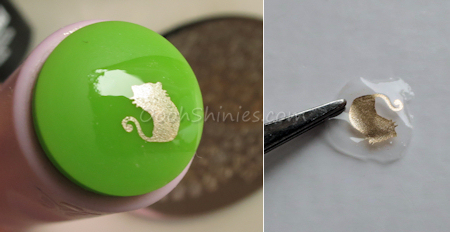 - Using tweezers can help a lot with handling the decal! - I struggled a bit with air bubbles under the decal (read: I redid it several times, haha) and found out that it works best for me to apply the decal in the middle, and gently rub it towards the sides so it gets stuck on my nails without airbubbles. But working from 1 side to the other might work better for you. - If there's a bit of decal outside of your nail, continue with your normal cleanup, but let your cleanup tool rest shortly on the excess decal. It'll break apart easily, and you can wipe it off your finger without smudging or pulling along the decal on your nail. - Tiffany commented that she just cleans up around the image on her stamper with a Q-tip and remover, and then stamps like normal. I haven't tried it yet with polish that doesn't dry as fast, but I'll have to try that, it would be much easier to deal with those smaller images like that! And while I'm typing this post, I'm thinking of another option that could possibly work? Apply top coat to oven paper or a ziplockbag and stamp your "dirty" image on it (see the 'nail applications/decals' post below for more info). Then cut it out after it dried as a way of cleanup, and use the decal afterwards. I think it'll work, but you'd have to be careful and it sounds like even more of a hassle - but might be faster when you want to do a bunch of nail with small images. OPI My Very First Knockwurst with A England Sleeping Palace and Bundle Monster BM-718. Have you tried any full plates, and do you have other ways of dealing with them? Several of the ideas mentionned in this post are things that I've seen on various other sites (I think it was Marta from who showed the cut out paper first, and Natalie who came up with the idea of a decal made on a stamper), and there might be more that I don't know yet, so if you have more tips or ideas... I'd love to add them to this post as well :) Thanks for looking and take care!